A couple of months ago, I saw this design software in Staples, and I immediately knew that I had to have it! I did a little research online and found that it got pretty good reviews. 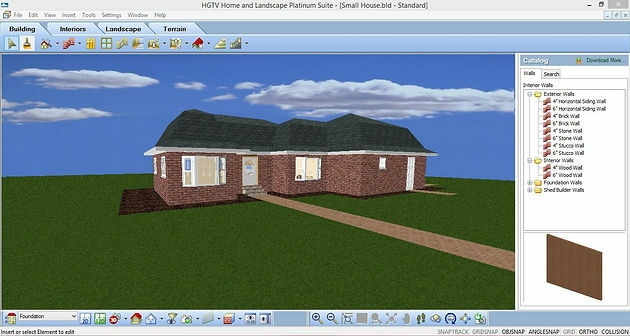 So, I shelled out $50 from my bank account and bought the HGTV Home and Landscape Platinum Suite design software (Version 3). And let me tell you, it has some amazing features! Truly amazing! There is 2,000 item plant encyclopedia, plant growth visualization over time, home and room builder wizards, and even ways to design an energy-efficient home! Based on the features alone, I would give it a 10 out of 10. But then I started using it, and I was SO excited! As I started designing a small, simple house, I realized that I had no idea what to do! The software is extremely hard to use! I’m sure that if I sat down for a few hours, or maybe more than a few hours, I could start to figure it out. I really hope that I do learn how to use it at some point, because I would love to use it with some future interior design clients! Speaking of that, I have actually had an informal client! Yes, it was my cousin, and yes, it was for a four-year old, but it is still a client! I designed her room with pinks and purples, and of course, the ever-popular butterfly. :) I even made a few scale drawings! I will do a feature on both my first design project and how to do a simple scale drawing soon! Overall, I’m glad that I bought it, but I still need to figure things out! Maybe for someone who has experience with AutoCAD it is not as difficult, but I have no experience! If I ever find the time to sit down and really figure this out, I will post about it in more detail. Again, I apologize for how brief, but since I don’t really know much about the software yet! Watch for more detail!